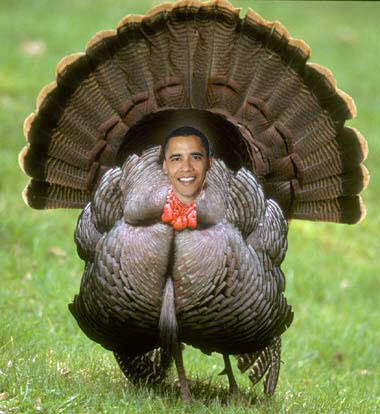 Watcher’s Council Nominations: Turkeys With Two Left Wings Edition | Virginia Right! That time of year is here again, and all of us here at the Watcher’s Council wish you and yours a simply wonderful Thanksgiving…with the exception of the turkey-in-chief pictured above. Welcome to the Watcher’s Council, a blogging group consisting of some of the most incisive blogs in the ‘sphere, and the longest running group of its kind in existence. Every week, the members nominate two posts each, one written by themselves and one written by someone from outside the group for consideration by the whole Council.Then we vote on the best two posts, with the results appearing here on Friday. This week’s contest is dedicated to that eminent marxist, Harpo..honk honk! First and foremost, hearty congrats to our fellow Council mate Trevor Loudon of New Zeal for successfully sneaking into America, wowing the natives with whirlwind book tour, scoring radio interviews and rave reviews from the likes of Glenn Beck and sending his new book Barack Obama And The Enemies Within to #87 on Amazon! Well done, bro! This week, Liberty’s Spirit, Monkey In The Middle, Maggie’s Notebook Tundra Tabloids and Capitalist Preservation took advantage of my generous offer of link whorage and earned honorable mention status. The Glittering Eye –So What? Creeping Sharia – Obama’s Muslim Advisers Block Middle Eastern Christians’ Access to White House – submitted by VA Right! ← Have a BLESSED THANKSGIVING!